Cleared for Takeoff | Who's Your Danny? The look on my son’s face, as he stood thigh high, looking up at the uniformed member of the Blue Angels flying squad, is one I’ll never forget. Zach was about six years old and we had just watched a flying exhibition that they, the world’s most skilled pilots, had performed. He decided that day that he wanted to fly. From that point on, airplanes were everywhere. Whether they were hanging from his bedroom ceiling or on his pajamas, he made it clear, flying was his passion. 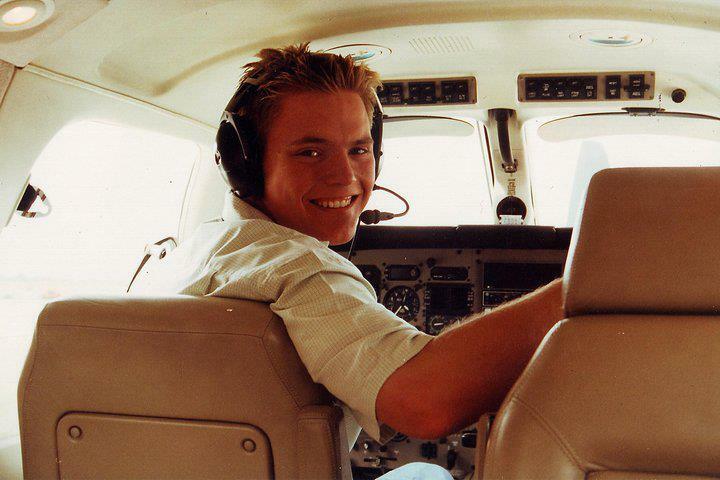 At the age of sixteen, Zach had acquired his private pilot license. I remember asking Zach to drive me to Lubbock so that I could pick up a vehicle. He said, “Hey Dad, why don’t I just fly you there?” I kindly turned down this generous request. Here are some of the reasons. First, he was sixteen years old. Second, He had qualified for his solo permit about thirty minutes before this conversation. Third, he was my son. The same kid that I taught to ride a bike. (Not THAT long ago, I might add) And an airplane has a lot more moving parts that a Schwinn Stingray. But, as only Zach could, he convinced me that it was a good idea. The next thing I knew, we were sitting in a Cessna 152 waiting for takeoff at Tradewind Airport. For those of you who don’t know planes, the Cessna 152 is the flying equivalent of a Dodge Neon. This was not a comfortable situation for a control freak like me. Then, something amazing happened. Zach took over. Not the sixteen year old who’d never shaved, but a highly trained, confident man at the controls of a vessel that was about to transport us thousands of feet above the really hard ground. Words can’t express his confidence. I had underestimated him, as I often did. He was prepared. Everything was in place. He calmly called in to get cleared for takeoff. I remember looking at his face as he stared out of the planes windshield. It was the same look he had when he admired the Blue Angel uniform years before. He was in his zone. “How do you know which way to go? Do you have to dial in some special coordinates? Does this thing have GPS?” These were the brilliant questions I came up with as we were reaching our cruising altitude. He said, “See that road?” “Yes, that’s I-27,” I said. “I think we’ll just follow that, it will take us to Lubbock.” He said with the patented Zach smirk. I don’t know where he got his sarcasm. It was time for me to shut up. From this point on, it became my favorite airplane trip of all time. We landed flawlessly amid Zach’s back and forth radio communications with the tower. I stepped off the plane with my briefcase and realized something at that moment that I hadn’t thought about. A whole new fear now encompassed me. I am going to have to watch my little boy taxi, get clearance, accelerate, take off, ascend, and disappear into the clouds without me, for his trip home. He was prepared. He did it. It was beautiful. I did not know the significance of this story until now. January 18th Zach filed his new flight plan. At some point, as parents, we are forced to let go. To release someone we love so much from our care is not easy. We can only hope that we have had a small part in the preparation of their hearts for the next journey. Now Zach has taken off into the clouds once again for his final trip home. He was prepared for this trip as well. He did it. It was beautiful. I love you, son. It’s hard to let you go, but this picture of you just comforts me to know that your heart was prepared for this trip. We just weren’t prepared for you to take off so soon. You’re not going to believe the party waiting for you on the other side. Say ‘Hi’ to Dad for me. Congrats on your new wings. Danny, that is beautifully said. Thanks for sharing. Wow, very touching!!! Tears in my eyes!!! Wonderful memories! God’s blessings to you!